13 m 5 star visitor attraction open to the public - official web site. Available for civil and religious weddings, and receptions. Self catering accommodation in estate lodges. Castle available for weddings and private celebrations. Restored castle in Perthshire - available for weddings. Self catering accommodation for 12 people. Lethendy Tower 17 L Advert for accommodation for 14, fully staffed and catered. Murthly 14 KKm Murthly Castle & Chapel - available for weddings. Near Dunkeld. 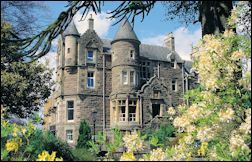 Stay with Scotland's Best B&Bs which are all small, 4 or 5 Star establishments.